The concept of “engaging” business rules and requirements transcends the three core concepts of analysis – identification, analysis and specification of business rules and requirements (all of which are essential building blocks of enterprise analysis). Inteq's Advanced Data Modeling training course enables participants to move beyond project specific rules and requirements to abstracting and generalizing the rules and requirements to enable cross-enterprise solutions. This requires highly evolved critical thinking skills to understand the essence of business rules and requirements; and requires sophisticated judgment to discern and make essential distinctions between unique localized (departmental, project specific) rules and requirements and the requirements applicable across the enterprise. “Engagement” requires the translation of the rules and requirements into logical data structures at the right level of abstractions to enable flexible, extensive, robust solutions that can rapidly adapt as business rules and requirements continually change. Inteq’s Advanced Data Modeling training course is about business analysis to support enterprise business solutions - not about the nuances of a specific physical database design. Advanced Data Modeling’s concepts apply across a wide range of initiatives from modernization of existing systems, development of new systems, implementation of vendor ERP solutions and business process reengineering. The concepts in this course are based on years of best practices gleaned from the spectrum of industries and subject matter domains across commercial and public sectors. It’s your roadmap for engaging cross-enterprise business rules enabling enterprise-level solutions. In today’s fast moving, highly competitive, complex business environment organizations can no longer afford the costly mistakes, operational inefficiencies and lost opportunities that result from taking a myopic project level rather than a cross enterprise perspective. Inteq’s Advanced Data Modeling training course transforms analysts into high-impact professionals; professionals that connect and engage with business people, uncover and rapidly assimilate deep business knowledge, and critically analyze and transform that knowledge into thorough, precise unambiguous business and user requirements. Inteq training has emerged as the gold standard for professional business systems analysis training - and are simply the most effective training programs available in the industry. Inteq training is more than education; its transformation - for the participants, project teams and their organizations. 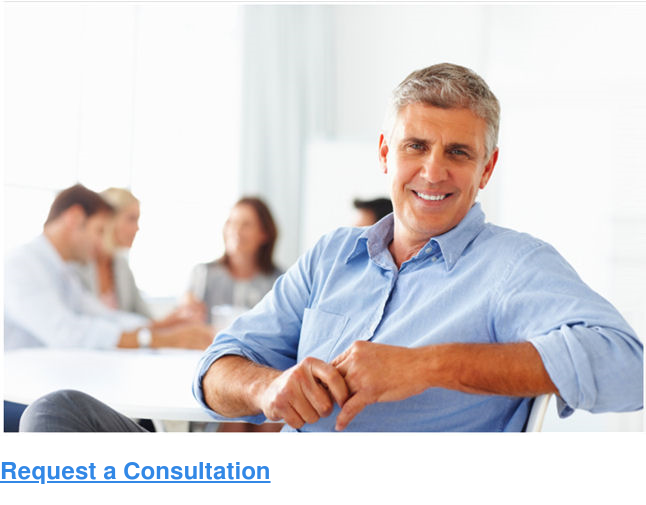 That’s why over 300,000 business systems analysis professionals worldwide choose Inteq training programs. Participants analyze a complex business case and create a detailed logical data model utilizing a variety of advanced patterns and analysis techniques. This session provides invaluable hands-on experience in applying the techniques to enable participants to immediately apply the techniques effectively within their own organization. Inteq's Logical Data Modeling training course. Data patterns that enable you to quickly recognize and accurately analyze complex cross-enterprise data oriented business rules and validate complex requirements. Generalization and abstraction techniques that enable flexible data structures that adapt to rapidly changing business rules and business requirements. To review and validate enterprise data models using a comprehensive and effective data model quality assurance approach. Best practice approaches to standardizing modeling components, meta-data and naming conventions across the enterprise. To identify and analyze the impact of normalization anomalies. To analyze the impact of data model abstraction on physical database design and systems development approaches. What is the difference between Big Data and BI? What is the difference between a business requirement and a functional requirement? What is the difference between a transactional business requirement and a BI business requirement? What is the difference a tactical BI requirement and a strategic BI requirement? What is the impact of BI requirements on BPM (Business Process Management)? 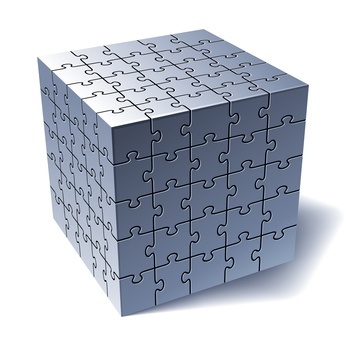 How are conceptual BI Business Requirements different from physical BI Business Requirements? What is the difference among a Dimensional Model, Business Data Model and Star Schema? Is ETL a business process or a technical process? 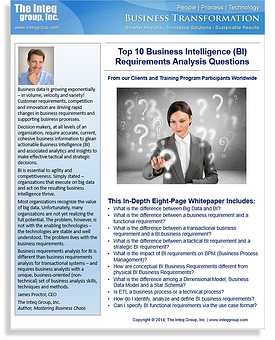 How do I identify, analyze and define BI business requirements? Can I specify BI functional requirements via the use case format?